Any old car project will stretch the budget, it is part of the deal. 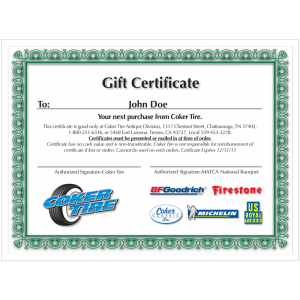 Give the gift of tires and wheels to your builder with Gift Certificates from the world's leading supplier of collector tires and wheels for vintage and classic cars. Our line of products cover muscle cars, antique cars, hot rods and so much more. We offer one of the most complete lines of vintage motorcycle tires and tubes as well. Visit our Collectibles section now for hundreds of unique gift ideas for automobile lovers, collectors and kids.